A new take on an old holiday classic favorite – the traditional green bean casserole. This is just the change you are looking for. Par-boiled fresh green beans may be used. Green beans and string beans are used interchangeable in the Cajun vocabulary. Shrimp may be used in place of crawfish. A note on the crawfish: If you are using packaged crawfish from your grocer, boil in crab-boil seasoned water. Allow to stand 5 minutes to soak up seasoning. Leftover boiled crawfish from a previous boil works great as they are already seasoned. Or sauté the crawfish with the onions and add extra seasonings to the mixture. In a medium saucepan, melt butter and sauté sliced onion until wilted. 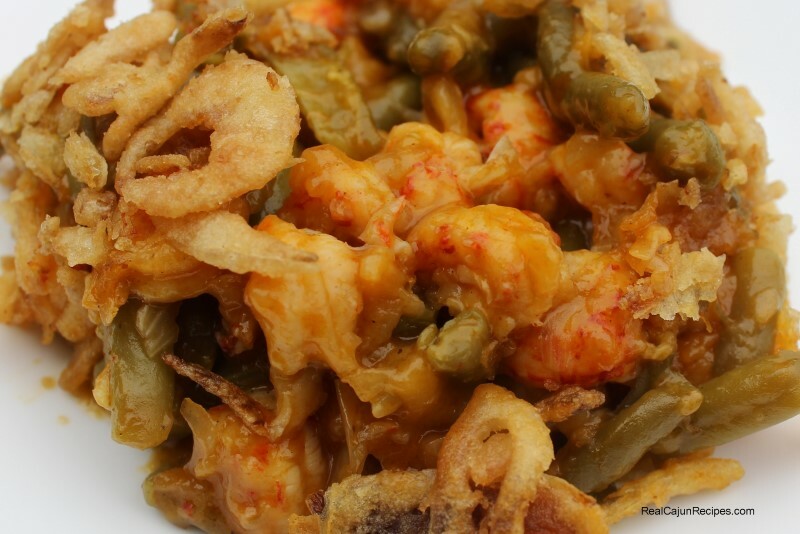 Combine the crawfish, beans, seasonings, soup and 1/2 can of the fried onion rings; mix well. As an option, you could add 1/4 cup crawfish water to the mixture. Pour into a greased 8x8 casserole dish and bake 15 minutes at 350 degrees; top with remaining onion rings and serve. This recipe easily doubles.